When famed playwright/actor Sam Shepard died last July at the age of 73, it gave us pause to examine the body of his work, a catalog that helped define the grimier side of Americana. His plays often focused on the hidden turpitude of violence-prone, unknowable Americans. There are no heroes here, only the bitterness of the outcasts of society, with stories that often accelerate into absurdity like a broken-down jalopy going downhill, losing wheels as it goes. 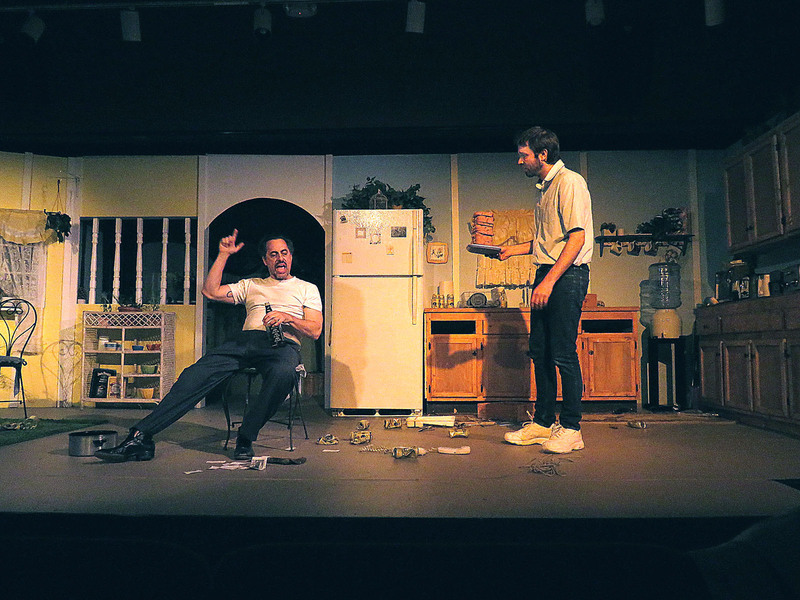 Such is the feeling that embodies the 1980 play True West, Shepard’s Pulitzer Prize-nominated satire of Hollywood and unattainable success. The Elite Theatre Company is currently staging a staggering, often electrifying performance of the play, which stars Aaron Gardner and Sean Mason as two warring brothers holed up in their mother’s Orange County home while trying to patshke together a screenplay for a stereotypically disingenuous Hollywood producer. Gardner understates the role of Austin, a studious, responsible, but less than successful writer with a wife and children who has gotten the opportunity to pen a romantic love story for producer Saul Kimmer. Austin is housesitting for his vacationing mother and is struggling to finish his screenplay in time to present it to Kimmer. Enter Austin’s estranged brother Lee (Mason), a no-account, parasitic drifter who subsists by looting homes, betting on dog fights, and hustling whatever money he can get. Lee is a demented powder keg, pouncing on Austin’s benign attempts to make conversation and liable to explode in violence at any moment. When Lee horns in with his own idea for a screenplay, Kimmer quickly shifts gears and orders Austin to write up his brother’s idea for a new story. The bulk of the play deals with the brothers arguing, threatening, and eventually nearly killing each other in the process. Mason is wonderful as the despicable, hostile Lee, snarling and spitting throughout Act I and then giving way to creative impotence as he struggles to write the screenplay himself. The two have diametrically opposed personalties: Austin meekly accommodating and Lee a thick-headed almost psychopathic bully. The wonder of True West is in how these two pathetic losers end up blurring their personalities until they are almost indistinguishable by the play’s end. At the outset, Austin, is quiet and timorous, head down in his typewriter while his obstreperous brother badgers him with inane, antagonistic questions. Austin appears helpless to be able to deal with his brother and lets him get his way at every turn, even lending Lee his car so he can get some peace and quiet in order to work. When Kimmer enters to finalize negotiations with Aaron, Lee sees dollar signs, and his dominant personality takes over. Kimmer tries to put him off with Hollywood-style platitudes, but Lee pushes and presses until he lands a golf date with the producer, eventually taking over the writing project. Act I takes its time as Shepard’s characters are slowly developed. In Act II, all hell breaks loose as the tables are turned, with Lee becoming the dedicated but frustrated screenwriter and Austin a stumbling, bumbling drunk who emulates his brother by leaving the house to loot a pile of toasters from nearby homes. The height of the black comedy comes when a frustrated Lee attacks Austin’s stubbornly uncooperative typewriter with a golf club while Austin serves up a foot-high pile of toast. By the time the play ends, their mother’s kitchen looks like a war zone, littered with silverware, piece of toast, and crushed beer cans. Buddy Wilds is perfect as Kimmer, a caricature of the typical, platitude-spouting, disingenuous Hollywood producer. Marilyn Lazik appears briefly at the end as the brothers’ daft mother, who absent-mindedly stands over her sons, chatting, while one tries to strangle the other with a telephone cord. The play is directed by Tom Eubanks while Roger Krevenas designed the modest tract home interior, complete with a full kitchen, which has to be laboriously reassembled with every performance. Although True West is described as a comedy, it is really more of a tragedy with comic overtones that is both unsettling and disturbing, which is precisely how Shepard works. Most of all, True West serves as a morality tale about sibling rivalry, the vacuousness of Hollywood, and how the siren’s song of success when combined with greed and desperation result in disaster and the apocalyptic demolition of an already dysfunctional family. True West plays through March 25 at the Elite Theatre Company in Oxnard. For dates and showtimes, see the VC On Stage Calendar.